Having treated the London opening as an out-of-town tryout, Ghost seems to be where it belongs in NYC, mirroring the action and pace seen every day on the streets with its often film-style projections. Tweaked to a fair extent, it arrives on Broadway a slick, flashy affair, with storytelling and pacing at premium levels. The balance of emotional drama and comic relief in particular are expertly handled in Joel Rubin’s book based on the hit 1990 movie he penned. Prolific director du jour Matthew Warchus juggles the whiz bang special effects, allowing them to serve, not overwhelm, the tragic, tender love story. Movie adaptations always require more scenes than regular musicals can handle, and this is covered by Jon Driscoll’s video and projection designs. Huge movable side and rear screens carry a sometimes dizzying array of images, taking us from downtown NY to Brooklyn to Harlem and back. Overused choreographed silhouettes quickly wear out their welcome but varying streetscapes support the action, as do the frequently used windows with spectacular views. A moving subway is one of the more exciting images created to great effect. Another nice touch is the massive display of photos, filling in part of the missing the “boy meets girl” aspect of the story. The tacky symbols paraded out for Oda Mae’s American Dream number “I’m Outa Here” are a low point. Solid elements are also part of the scenic design and the effortless changes of the projections makes the physical set changes seem a little tedious in comparison. The story is still presumably set at the end of the 1980s, although nothing in Rob Howell’s design particularly flags this. For reasons unclear, Sam’s favourite poster has changed from Princess Leia, in London, to Barbarella here. With almost all creative elements handled by leading theatre professionals, the one jarring element is choreography. Clearly not a choreographer’s bootstrap, Ashley Wallen has put together distracting jerky bodies in dreary formations without so much as a hint of storytelling. Has a more physically attractive couple than Richard Fleeshman and Caissie Levy ever graced the stage? None spring to mind at this moment in theatre history. Reprising their roles from London, the pair sing the American Idol score with effortless ease, their commitment to their characters a significant factor in the avoidance of maudlin or saccharine pathos. Levy, as Molly, has maybe one longing ballad too many but when they sound this good it is not really a problem. Fleeshman, in ghostly pale blue light for most of the show, drives the action with energy and passion. In a most auspicious debut, Da’vine Joy Randolph captures the joy and vitality of Oda Mae Brown, rocking the outrageous costumes and gaining the audience’s affections with ease. Tyler McGee gives memorable, high energy support as Subway Ghost, making the rap number “Focus” not stick out in the score as it may have done in less capable hands. Dave Stewart and Glen Ballard’s poppy score is instantly accessible, if not overly memorable on first hearing. London’s overly jaunty song for the Hospital Ghost has been improved here, although now there is an operating room full of oddly costumed ghosts who have no voice as we no longer hear their stories. Sure to be a crowd pleaser, Ghost is sit-back-and-enjoy fun. Australian audiences are sure to lap it up next year as well. 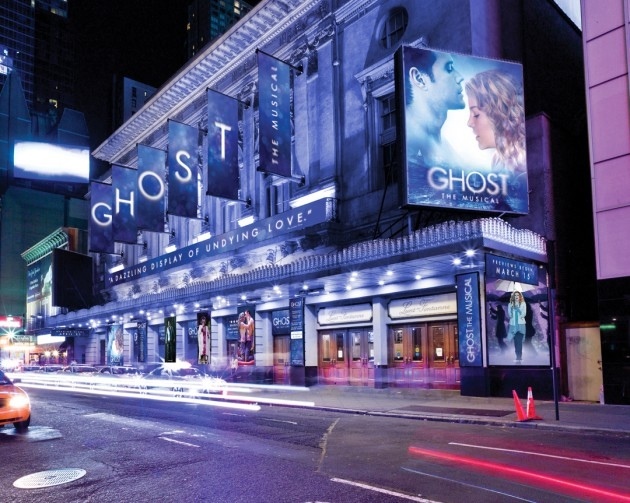 Ghost officially opens 21 April 2012 for an open ended run. Reviewed 8pm Thursday 12 April 2012 at Broadway’s Lunt-Fontanne Theater.